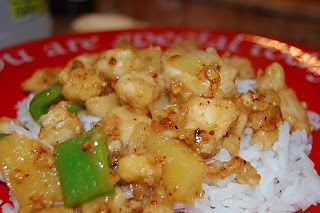 We celebrated my oldest daughter’s birthday with Sweet and Sour Chicken. The recipe is adapted from the More with Less Cookbook. 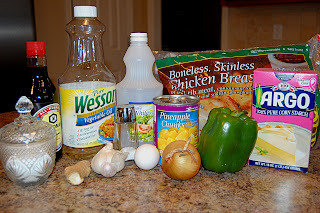 Mix up the marinade and add the chicken or pork. Let it stand 20-30 minutes while you prepare the other ingredients. Dredge the meat in cornstarch. Fry on all sides until brown. Remove from the skillet and keep warm. Stir fry the garlic, ginger and vegetables in oil, 2-3 minutes. Add the sauce and cook just until the sauce thickens and clears. Return the meat to the skillet. Serve with hot rice. I keep thinking I need to double the pineapple and sauce amounts, but I haven’t done it. We would like more sauce than what the recipe makes. This looks so good! And pretty easy! Always a plus. Side note: I grew up with one of those “Special Day” plates. We loved them so much that my mom gave us each one when we got our own places. It is a great little tradition. That looks really good. I like how it’s fried a little bit first, would imagine that makes it a little bit crispy. Yummo! We will certainly do this! BTW, where do you get those groovy plates? I would really like to have one at our house! Thanks for the recipe! that looks a lot beter than the sweet and sour chicken I’d been making. I’m going to try it! I think I get that red plate from Discovery Toys ages ago. Pampered Chef sells a blue version – at least I’m pretty sure they do. Nice to meet another SITSta. 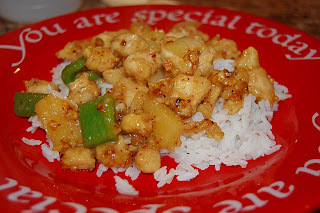 We love sweet and sour chicken, but I did not know how to make it until now. Thanks! Thanks for stopping by my blog. I’ve been here before! I remember the Suzy Bake Oven. Oh how I need all your recipes. Thanks for introducing yourself. I’ll be back often!!! This is my first time to stop by. I came over from Small House. I will be back to try the recipes. I really want to try the sweet and sour chicken. The stew looks good. If it can be cooked in a crockpot I am all for that. Thanks for letting me peek. This sounds great, I love chinese food! Looks delicios! Thanks! And…thanks for stopping by my blog! This looks yummy! I might have to add this to next week’s menu! !